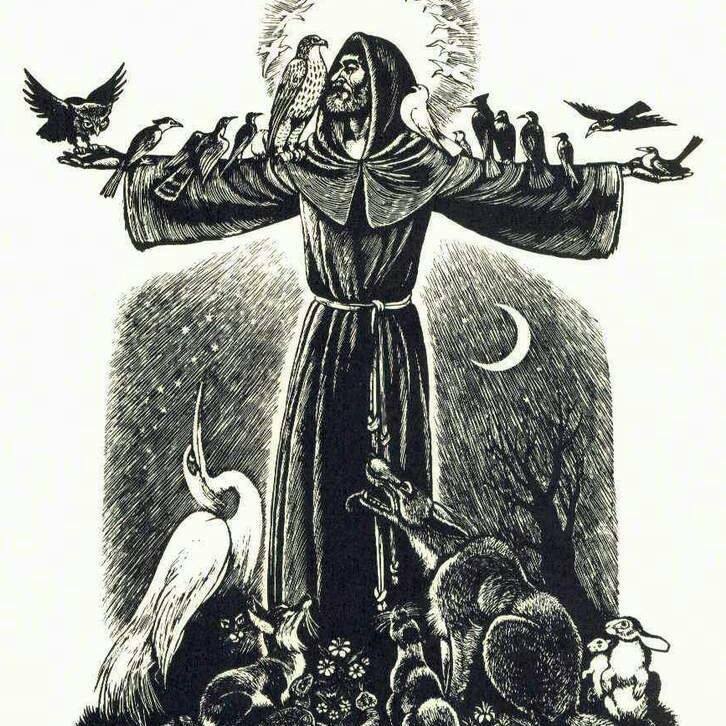 Saint Francis, the son of a merchant of Assisi, was born in the year 1182 in a poor stable, his birth already prophesying the Saint who would preach poverty to a world seduced by luxury. Though chosen by God to be for the world a living manifestation of Christ’s poor and suffering life on earth, in his youth he was generous, always of equal humor, and much appreciated by his friends; he was fond of splendors, fine clothing, and good company, and easily won the affection of all who knew him. More than once various holy persons foretold for him a future of glory, but in veiled terms. Francis did not understand these predictions, and supposed he would become the leader of a large militia. The military life he had adopted ended when Jesus told him he was destined to fight another kind of combat, one against the demon and sin; that the grandeurs predicted were spiritual, not temporal — and to return home. He became inspired with a great esteem for poverty and humiliation. The thought of the Man of Sorrows, who had nowhere to lay His head, filled him with holy envy of the poor, and constrained him to renounce the wealth and the worldly station which he had come to abhor. One day, while on horseback, he met a leper begging alms who inspired him with repugnance, and he took a path to avoid him. Then, repenting, he turned his horse around and returned to embrace him and give him a generous alms, as was his custom for all beggars. He continued on his way, but looked back, and nowhere on the plain could the stranger be seen, though there were no trees, no refuges anywhere. He was from that day a completely transformed person. He decided to use his wealth to care for the poor and the sick, and dedicate himself in person to the same works. When he prayed one day in the little chapel to do only what God willed of him, the Saviour spoke again to him, repeating three times the mysterious words: Go, Francis, and repair My house which is falling into ruin. He then undertook to repair the old church of San Damiano where he had heard these words, retiring for refuge to a grotto. He was regarded as a fool by the people, when he returned to the city in the clothing of a poor beggar. This was indeed the folly of the Cross. Francis renounced his heritage definitively, to beg thereafter his daily sustenance and what he needed for the repair of the church, and left the city singing the praises of God. He repaired two other churches. The love of God which was burning brightly in the poor man of Assisi began to give light and warmth to many others also, and it was not long before several came to join him. One of them was a very wealthy man of Assisi, the second a Canon of the Assisi cathedral, and the third the now Blessed Brother Gilles. They adopted the absolute poverty of Francis, and the foundations of the Franciscan Order were laid. They were first called the penitents of Assisi. No counsels could make Francis change his resolution to possess nothing at all. God revealed to him then that he was to found a religious Order. Pope Innocent III, when Francis with his first twelve companions journeyed to Rome, after first rebuffing them, recognized him as the monk God showed him in a vision, supporting on his shoulders the Church of Saint John Latran, which was growing decrepit. He received the profession of Francis and his twelve companions, and in 1215 they were formally constituted as a religious Order, which then spread rapidly throughout Christendom. In 1216, Saint Francis after assembling his religious, sent them out to preach in France, Spain, England and Germany, where they established monasteries, lasting proofs of the efficacy of their missions. A second general Chapter was held in 1219 on the feast of Pentecost, and the little Brothers gathered from all over the world at Saint Mary of the Angels, the church which Francis and his first twelve disciples had received only nine years earlier. Cabins of reeds and tents were put up all over the countryside. The Cardinal who visited them exclaimed, with tears in his eyes, O Brother, truly this is the camp of the Lord! They were more than 5,000 in number. Saint Francis exhorted his brethren: My Brothers, above all, let us love the Holy Church; let us pray for her exaltation, and never abandon poverty. Is it not written, Trust in the Lord, and He Himself will sustain you’? Francis, after visiting the Orient in a vain quest for martyrdom, spent his life like his Divine Master — now in preaching to the multitudes, now amid the desert solitudes in fasting and contemplation. His constant prayer was My God and my All! During one of these retreats on Mount Alverno, he received on his hands, feet, and side the imprints of the five wounds of Jesus. With the cry, Welcome, sister Death! he passed to the glory of his God, October 4, 1226, at the age of 44 years.